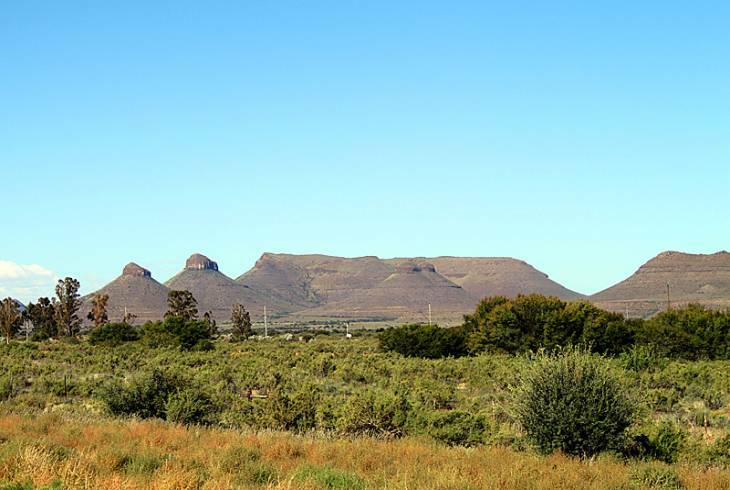 Three Sisters is a landmark along the N1 in the Karoo National Park and is situated about eighty kilometres to the northeast of Beaufort West. It is at the junction of the N1 and N12 national routes, and has become a popular stopping off place with the building of a Shell Ultra City there. Three Sisters gets its name from three clearly visible and almost identical dolerite-topped koppies in the vicinity. These were formed by the differential weathering of a dolerite sill. There is limited accommodation available in the area. A small village in the central Karoo might appear to be an unusual place to visit , but for the model train enthusiast, there is a true gem secluded away in the attic of an old farmhouse there. Owner Johan Hamman has over 600 metres of model train track laid out in the attic of his farm, with model trains from all over the world. Three Sisters overview. Three Sisters Accommodation and Information.